Join Cap’n in this swashbuckling adventure! Click here to play! Sail the high seas in a quest to find buried treasure. If you can stick it out in this pirate world, you’ll definitely be bringing home a sack full o’ gold doubloons. As you’re searching the extents of the earth for buried treasure, you’ll definitely want to spin in the treasure symbol as much as possible. This symbol filled with golden, sparkling coins and gems is a substitute and will replace most other symbols to help you create more winning combinations. It will also payout up to 6000 times your line bet if you can spin one to five of them across an active payline. Look out for Cap’n as this feisty gal is not only leading your voyage, but she also brings in up to 1500 times your line bet if you can gather two or more of her symbol across a payline. There are also plenty of other symbols to help you in your quest for buried treasure, including Scallywag, islands, parrots, coins, cannons, maps, skulls, and kegs. A pirate’s ship is invaluable in searching for buried treasure, which is definitely true in this game. 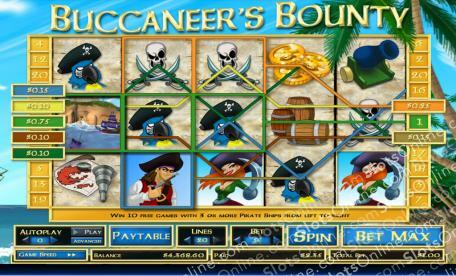 This ship is a scatter and will multiply your total bet if you spin two or more anywhere on the board. It will also award you with a number of free spins if you get three or more across the board. So, hop aboard and take to the seas in search of your pirate bounty. The pirate ship acts as a scatter. It will multiply your total bet if you spin two or more anywhere on the board. Also, if you spin three or more anywhere on the board, you will get 10 free spins during which all prizes are doubled. The treasure acts as a wild. It will substitute for all other symbols, exlcuding scatters, to bring in more winning lines. It will also py out up to 6000 times your line bet if you spin one or more across an active payline. A bonus feature is triggered when you spin the treasure chest on reels 1 and 5 at the same time. During this game you will have to shoot down ships with your cannons for bonus prizes. You'll get 10 shots and the more ships you put down, the more money you earn.